This won’t come as a surprise to most of you, but, I drink a lot of gin. It is hands down my favorite spirit for cocktails and my collection shows that. At present my home collection contains around 20 bottles. That aside, up until last week I didn’t have a bottle of Beefeater in my collection, which is tremendously strange. Why? Well, whenever I’m out at a restaurant and I’m ordering my fallback drink, the Gin and Tonic, I always order it with Beefeater. For me the flavor is perfect for a G&T. As you bring a glass of Beefeater to your nose you’re immediately going to notice both citrus and juniper aromas in perfect balance. Neither aroma overcomes the other. The initial flavor echoes the same perfect balance. Both flavors are crisp, clean and not over powering. As you continue to sip you’ll notice a nice warming effect and the other botanical flavors will start to emerge. You’ll get no burn from this spirit as you swallow it, which is a bit surprising unto itself given Beefeater is 94 proof. Finally the finish is tremendously pleasant and marked with juniper and herbal flavors. Overall a really fantastic gin. The primary reason this gin is my go-to for a G&T is that balance between citrus and juniper. I like to be able to taste the juniper flavors in my drink but, at the same time, the citrus pairs really well with the tonic’s flavors and the lime. A gin such as Beefeater that balances those components gives you the best of both worlds. One final note. You’ll notice in the picture that the bottle is nearly half empty. That’s because every Ramos Gin Fizz I’ve made this week has used Beefeater. I think it’s a great pairing for this drink as well. The citrus pairs well with the juices and the juniper flavor makes the drink much more complex. But, more on that as I wrap up on Saturday. 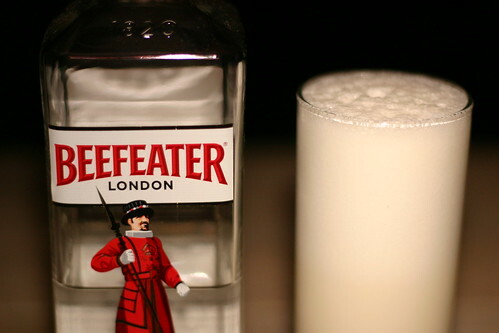 Beefeater gin is 40% abv in Canada and its quite mellow.